This Graze Box review covers the last two weeks during which time I received two new snacks to try out. With my delivery day coinciding with Good Friday, Graze sent me an email letting me know they’d posted it out a day early, so I should receive it on the Thursday. And like every Graze box so far, it came right on the allotted day. There were three favourites in here including Apple and Cinnamon Flapjack, Lost Army and Fruit Sangria. And the new snack was called Born in the USA. Onto Friday the 13th. Again, three previous favourites were here, including Green Olives with Chilli and Garlic, Tom Yum Yum and Fig Roll. New to the selection was White Chocolate and Raspberry Cheesecake. Mmmm, just typing that makes me hungry. 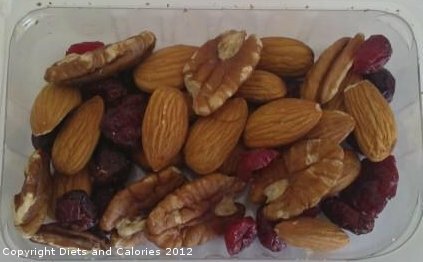 This punnet contains a generous mixture of crunchy whole almonds and dried cranberries together with some delicious pecan nuts. According to the nutrition leaflet, eating this snack will provide one of your 5-a-day. This week’s health topic is all about healthy fats. We are told how important nuts and seeds are for maintaining healthy cholesterol and how they allow the body to absorb vitamins A, D, E, and K.
They’re also important for the brain which uses these fats to keep cells strong and healthy. 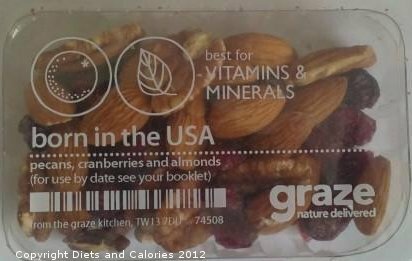 Eating just one small Graze punnet containing nuts and seeds, such as Born in the USA, provides good quality unsaturated fat and healthy omega 3s and 6s. When I began receiving Graze boxes, I wasn’t that crazy about almonds. But, with all these interesting snippets of information which arrive each week, I’m starting to see them as little health tablets. Each time I eat one I feel like it’s doing me good which somehow makes them taste even better. We all liked this punnet so I’m rating it as LIKE. This snack sounds so tempting and it looks even better. Obviously I wasn’t expecting a slice of actual raspberry cheese cake. Instead, this punnet contains some intriguing sounding raspberry infused cranberries, white chocolate buttons and hazelnuts. The chocolate buttons, as expected, are very tasty. But the hazelnuts and cranberries are exceptionally good. I like hazelnuts but usually only eat them if they’re part of some muesli I’ve bought. These hazelnuts are different, dark and gorgeously crunchy with a really intense flavour. I could have eaten the lot in one go. Quite a few of the Graze nibble snacks contain dried cranberries which are nice as far as cranberries go. But these cranberries are in a league of their own. Although they’re called raspberry infused cranberries, the ingredients include concentrated elderberry juice and ‘natural flavouring. I’m not sure whether the natural flavouring is raspberry though. But whether or not raspberry is in there, they have a deliciously sweet flavour which, to my tastebuds, makes them far tastier than plain old cranberries. We all loved this punnet and will definitely rate this as LOVE. This week’s snippet of information in the Graze nutrition booklet tells us ‘don’t feel sorry for the biscuit...’ We’re then told that by keeping a Graze box close to hand, we can replace a naughty snack with a wholesome graze nibble whenever we feel peckish. I know I feel a lot healthier when nibbling on graze snacks than I ever do when eating a biscuit. But I still can't help wanting the odd biscuit now and again. As long as the calories aren’t too high I figure they can't do too much damage. Besides, with so many mini varieties available nowadays, it's much easier keeping the calories down. 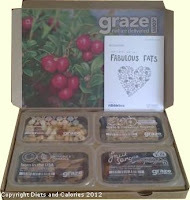 If you’d like to try out a Graze box, you can order one completely free using this code: 9HZTPXFD. All you need to do is log onto Graze, enter your details, choose your type of Graze box and enter the special code (9HZTPXFD) for your free box. Please note this is for a limited time only. 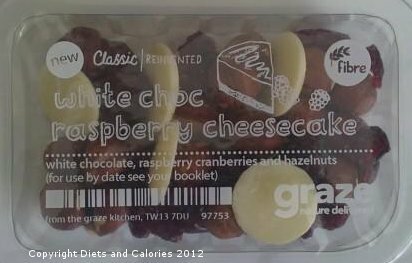 For more Graze reviews - click here.